I saw this nifty article yesterday and it got me thinking about what most of our fantasy settings are like – a medieval or renaissance Earth-like planet that has magic… Ok. I get it from the perspective of playing off of themes we are familiar with, and I know our industry started out with a medieval war-game, but why not make fantasy settings really unique? With magic, gods, epic wars, and other, well, fantastic elements, we have some license to stretch the boundaries of geography and physics. So here are some unique geographical elements that you can add to your fantasy world. 1. 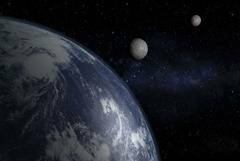 Ok, we’ve seen multiple moons, but why not a habitable, reachable moon..
Having a moon that is reachable by airship, magic, technology, or some other incredible means opens up a lot of possibilities. Maybe the “ancients” lived there with technology beyond the ken of mortal people. Maybe it is where the gods live. Perhaps the PCs live on the habitable moon and fear the people of the world below. We are used to wars between continents or groups on terrestrial land, but the conflicts and stories that could occur between people who are separated by even vaster differences, but are not from different planets. A moon is still part of the planet it orbits. It still feels like part of the world. So the conflicts and stories that could occur between a planet and it’s moon can feel alien, yet appropriate. A fantasy world I work on has rings around it. I was never quite down with the concept, and the designer of the world had some pushback from me and a lot of other developers, but he insisted and they got incorporated. Until I saw this, I didn’t really get it. Having rings around a planet makes it feel less mundane, less bland. It’s not a big change, but having a planet that is just a few degrees off of our real world enhances all of the other fantastic elements, like magic or fantasy races. 3. Why Not A Great Chasm? Well, it’s a pretty good chasm… In a lot of fantasy games, we have the idea of an inhabited interior of the earth. 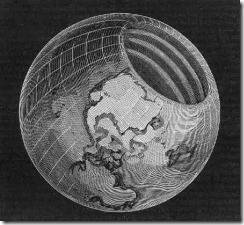 Whether it is the Underdark or the hollow earth, the concept of things living inside the earth is somewhat accepted. So think about having a big chunk of the world ripped away, a giant chasm that everyone knows about. It would expose the underworld and change the way that connects with the overworld. Perhaps it is a trading zone for miners from the chasm to trade with sailors from above. Maybe the Drow or other races that live in that part of the underworld are culturally different from their more secluded brethren. Like the habitable moon idea, a giant chasm creates an opening to a new world that is still part of the planet as a whole. It is considered part of the world, but there is freedom to operate in different ways. Having fantastic elements in a world is great, but what about areas that never stay the same? Faery woods are one example, but what about a desert that blooms over with flowers and trees in the course of one day, but then fades again to desert. Travelers would have to plan carefully and hope luck was on their side. Giant elementals could trudge the lands, leaving a swatch of…. well, their element in their wake. Rivers, forests, trenches and mountains, deserts or burning slag, could all be outside your door when you wake up, providing a new and unique challenge for players to overcome. Messengers could warn of the changing sands moving closer, or the appearance of an earth elemental. Farmers might try to coax water spirits nearer in order to improve their luck. Fantastic elements already exist in our fantasy settings, but the malleable nature of gaming lets us experiment with even wilder elements than we currently do. Add a very unique element to a predefined setting and see how it changes the play style. See if something more incredible might spice up a homebrew setting. Or do you prefer vanilla worlds that are metaphors for the real world? What style of world/setting do you most enjoy? DLE3: Dragon Keep featured an adventure on the Dragonlance/Krynn moon of Lunatari. The map was fairly extensive and required exploring the moon to find a special portal. It was fairly detailed and populated with creatures and encounter areas; it was essentially a hexcrawl on the moon. I’m not sure but Forgotten Realms has many portals and Pathfinder’s world has a bunch of portals as well and are used fairly frequently for ease of travel. I remember reading a Dragonlance book that had something similar. A mage went to an academy there that was shielded by magic. It was nifty, but to me it felt like unfulfilled potential. More a fantasy moon-base rather than a whole new world to explore. Were the creatures and areas the kind you’d write up like it were our moon, or where they more diverse than that? It was more of a new world to explore than a one-off encounter. I’ve been tinkering with a cylindrical hollow world. The edges have cyclopean “impassible” mountains; most people think the domain of the gods are beyond. Originally I put a rotating spherical sun/moon at the exact center of the cylinder; one side is dark to provide night. Alternately, light shines from both sides; the equator is the cold zone and in the shadows of the World’s End Mountains is a barren desert. What kind of games are you thinking of doing in that setting? I’m curious how a world like that would affect the mythologies and play styles. We’re so used to falling back on tropes from medieval based worlds, but would things have evolved differently on a world that is shaped and operates differently? Kinda sorta sounds like Larry Niven’s Ringworld. Pathfinder Campaign Setting: Distant Worlds is a great book for populating other worlds (and orbs) outside of your primary world. I love musing about things like this. Part of the debate is how much to emphasize the difference and when to bring it in. If there’s a reachable, exciting moon–do you save it for high level play? What happens when the PCs hop a sky-train immediately because it seems exciting? All told, though, fantastic elements are great for showing why it’s not just medieval Europe + magic. I love the idea of the Magical portals, there’s countless opportunities with that, and can give even more depth to the sense of urgency and danger that could literally ‘pop up’ anywhere. In my home brew campaign, I have an unreachable (for now), floating glacier that is the basis of the Kingdoms river systems, with the capital city surrounding the lake that is below the glacier (with a number of ‘water falls’ and such pouring down. This is a bit off topic, but if we are looking to change tropes. Consider running a Monster game, where PC’s play as monsters, (either being mysterious) OR have the Core races be the monsters with the PC ‘monsters’ be the civilized ones. Starting with Ultima III, the CRPG series used a series of “Moongates” to allow rapid travel around the globe. The opening gate was determined by the phase of the 1st moon, Trammel, and the destination was determined by the phase of the other moon, Felucca. Kaidan, the Japanese horror setting (PFRPG) from Rite Publishing is more like Ravenloft than most settings, in that it’s a closed system. One can travel into or out of Kaidan by ship, as long as the misty borders are open, however, no one can teleport, plane shift, astral travel or any unconventional means to entry or exit. It has it’s own cosmology within it’s closed system, including a pocket ethereal plane (Yomi, the land of the dead) and it’s own private hell (Jigoku), actually one of the planes of the Abyss. Even if you’re from some other place outside of Kaidan, if you die in Kaidan, your spirit is now bound to Kaidan’s cursed reincarnation cycle – your spirit will never greet it’s deity in it’s heaven/outer plane. An adventuring career in Kaidan involves living multiple lifetimes. While this does not look at the moon or inside the ‘earth’, Kaidan is an island archipelago coexisting in the prime material, and at the same time a pocket plane of it’s own. This makes the dread realm completely unique in it’s own way. There does exist permanent portals between Kaidan and it’s outer planes, though their existence is known to few. Most require some means of opening the portals once found, usually by giving sacrifices. One such portal (to Jigoku) is found in a well near a ryokan (country inn). It was discovered when a murderous innkeeper pushed her maid out of a fit of jealousy into the well, killing her, which opened the portal and allowed an oni to enter for mischief. There does exist a permanent open gate to Jigoku, though it is heavily guarded. What you’re describing with the naturally occurring magical portals idea is essentially Planescape, all in one world. The idea that “most of the portals are stable, but that newer, less established ones appear and disappear without a pattern” is Very Planescape. Tumble to the chant, berk. Though not hugely fantastic at first glance, the current campaign I’m running is set in a universe that’s shaped a bit like an egg with a flat earth. The edges of the world flow into a waterfall that rises into the sky forming the Astral Sea where the gods dwell on their islands (seen as stars from below). The sun rises from the Elemental Chaos to cross the sky each day before plunging into the seas again, all the while slowly swinging like a pendulum to the north and south to create the seasons. The moon itself just goes in a circle through the sky, never setting but being outshone by the sun during the day. Then there’s the whole issue of the Feywild and Shadowfell and how they play into things (the Feywild being the source of magic/life, while the Shadowfell sort of eats magic/life). I like the rings, in particular. An interesting thing about a world with a ring is that depending on the density of the ring, it could cast a shadow or even complete darkness over a section of the earth. You can even see this shadow on some of the shots from space in the video. Because over the course of the year, the axial tilt of a planet relative to the sun changes (this change is responsible for seasons) but the ring would stay stationary with respect to the surface of the planet, this band would creep back and forth over the equator. Just like the way the ring itself looks narrower or wider from different latitudes, so would this shadow. Because the shadow would have a cycle of an entire year, it would likely be over some areas for weeks if not months at a time, giving your campaign world parts with extended “nights” without having to travel to the poles. Oooh. Here is one more fun geographical oddity. Singing sand dunes. I really want to use this in my next game. I sometimes toy with idea of setting a campaign on a cubic world. The edges of the cube would be vast mountain ranges that reach out of the atmosphere. At the centre of each face would be a great sea that, from an outside point of view, bulges out from the side of the cube. The mountain ranges would have resulted in vastly different cultures, if not evolutions, on each face. The inhabitants of each face would be unaware of anything beyond the great sky-touching, world-girdling mountain range until… [insert plot point here]. Of course, you could run a whole campaign without the PCs or players being aware that it was set on one side of a d6. Lol. That would be hilarious to see in play, especially if the campaign itself was incredibly epic. The Great Chasm example has been done by one of the greatest medieval authors, so it is surprising that it is not more popular. In Dante’s Divine Comedy Satan formed a great chasm (the pit of Hell) when he fell from heaven and crashed into the earth. He hit so hard that he became the center of the planet and the displaced earth created Mount Purgatory on the other side of the planet, which was a mountain that reached all the way up into the heavens. A person, like Dante could go into the pit or, like Ulysses, could pilot a ship to the island of Purgatory and climb all the way up to the populated planets above. The planet in this cosmology, then, is rather malformed from Satan’s impact. Also, in this model, man’s tendency toward evil the principle behind the force of gravity, causing all physical matter to tend toward the center of the earth. I worked on a setting a few years ago which was basically a bunch of realms that existed in some sort of space-time bubbles connected by portals. Technically not a fantasy “planet”, as it were, though I had a vague idea that it might have been a planet at some point, until some cataclysmic event in the distant past splintred the world. The world design was originally inspired by the 1988 Flash Gordon movie, where Mongo is a vortex which acts as a breathable atmosphere whith the different worlds being basically inhabited moons floating around in it. Also, I suppose, the Death Gate-cycle (Weis/Hickman). The realms would vary greatly in scale, from a few continent-sized ones to those the size of small countries or fiefdoms. I had them arranged in clusters, usually with similar climate and environments, that had direct access-ways through portals, some relatively stable, others forming and disolving either randomly or in some kind of pattern (thus, finding and “reading” portals was a valuable skill). For a while, each realm was also to have one stable portal to a “central realm” of sorts, like a kind of umbilical cord. This concept turned out to be rather hard to wrap my head around. That central realm I imgined would have to had been a constant battleground, whith imperial pretenders from all over converging in this one place. I abandoned the concept and figured instead that each cluster had a few connecting points to other clusters, possibly these “greater portals would move around between different realms within the cluster, creating a complex system of routs to move to more exotic locales. Currently in my bucket of half-considered ideas.